Little is known about the specific events in Euclid’s life, but ancient historians suggest that he was born around 330 B.C.E. near Athens, Greece, where he was educated. Euclid moved to Alexandria shortly after 300 B.C.E., when Alexander the Great’s successor, Ptolemy Soter, established the famous library and school there. Euclid began teaching mathematics and soon became recognized as one of the leading mathematicians in Alexandria. Other works of Euclid include a geometry text, Data, and a book on astronomy and the geometry of the sphere, called Phenomena. Euclid’s work was not restricted to geometry. Even Elements contains results from other areas of mathematics including number theory. His work in number theory includes the classic and beautiful proof that infinite numbers of prime numbers exist. He also wrote the book Optics, an important treatise on mathematical representations of optical phenomena. 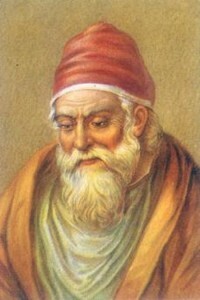 Euclid died around 275 B.C.E. Euclid’s influence on mathematics was immediate and lasting. In Elements, he introduced a logical structure to mathematical exposition that continues to influence mathematicians and the way in which they write mathematics. Euclid was not the first author of a geometry book. In fact much of the mathematics included in Elements had appeared before. Also Euclid was not the first to compile the known geometry into a single text. The geometry text used at Plato’s Academy was written by Theudius; this is the book that Aristotle presumably used. However the influence of Euclid’s Elements lies in its logical structure and comprehensiveness, features that quickly distinguished it from other existing works in mathematics. Euclid’s choice of what needed to be assumed and the logical way he structured the subject were the reasons that Elements quickly replaced texts that preceded it and why most of it is still used today. Elements contains some mistakes that have offered challenges to mathematicians throughout the centuries. These mistakes have been noted and, where possible, corrected. Proving Euclid’s parallel postulate preoccupied mathematicians for centuries. The postulate states that given a line L and a point P not on the line, there is exactly one line through P that is parallel to L. The postulate preoccupied even Euclid; he delayed using the parallel postulate until he had proved all that he could without it. After many false proofs, future mathematicians realized that Euclid’s geometry needed the parallel postulate as an assumption that could not be proved. Replacing the parallel postulate with others led to various non­Euclidean geometries. For instance, Russian mathematician Nikolay Lobachevsky established a theory of non­Euclidean geometry in 1840 that insisted that the parallel postulate did not hold. He started a revolution in conceptualizing continuous space that led others (including Georg Riemann and ALBERT EINSTEIN) to try to describe three­dimensional space in ways that accommodate how light and matter behave. Euclid – c. 330­c. – 275 B.C.E. * Scholars cannot date the specific events in Euclid’s life with accuracy. Posted on March 7, 2015 by Natalie. This entry was posted in Mathematicians. Bookmark the permalink.